What is a Good Credit Score, and How Do You Get One? Your credit score at its simplest definition is a number between 300 and 850 calculated from information that’s on your credit report, including information like your history of payments, how much debt you have and how long you’ve actually had a credit history. Like any other score, the number tells a story about your and your behaviors. In the case of a credit score, it’s all about giving potential lenders and creditors (i.e. banks, credit card companies, credit unions, etc.) landlords and even employers insight into your behavior when it comes to managing your finances. This is an important factor to help them determine things like your creditworthiness, and also how responsible you’ll be in a given situation. While this is not a test, it’s reasonable to want your score to be at least good, if not excellent. But what is a good score - and how is that different from an “average” score? Just where does it fall in the credit score range? 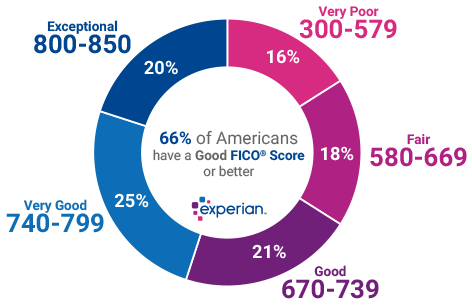 This graphic from Experian tells a clear story about the typical credit score range, from the lowest credit score possible to the highest one. It’s “typical,” because the three top credit bureaus - in addition to Experian, also TransUnion and Equifax - use slightly different scoring models. It’s also possible that some of the information on your credit report may be different, as not all lenders and creditors report your information to all three bureaus. So your credit score will vary slightly. That said, in general a good credit score is between 670 and 739. This tells potential lenders and others that you’re a relatively safe bet. And while it doesn’t guarantee you’ll get approved for credit or a super low interest rate, having a good credit score certainly opens financial doors. According to recent information from FICO, the average credit score in the US. is 704, approximately in the middle of the “good” credit score range. If you have a score of 740 up to 799, you’re considered in the “very good,” range, and 800-850 as “exceptional.” Those with the highest possible credit scores enjoy benefits that go beyond bragging rights: you may enjoy lower interest rates, higher credit limits, and more perks from lenders and credit card companies. Being responsible has its rewards. Conversely, a fair score of 580-669 will categorize you as a “subprime borrower” and those with a very low score of 300-570 will have a hard time getting credit or loans at all. Sometimes you can’t avoid low scores, particularly if you’re just starting out or have had negative behaviors in the past like accounts in collections, or a bankruptcy or lien. In those cases, there are certainly steps you can take to improve your low credit score over time, including clearing up old debt, making sure you get credit for positive behavior like paying your rent on time, and disputing any erroneous charges on your credit history, among other smart steps. ● Always pay your bills on time. This goes for all bills, not just credit cards. So rent, utilities, and so on also count - and can either positively or negatively impact your credit score. ● Check your credit score regularly. You are entitled to a free copy of your credit report annually from each of the top three bureaus, so be sure to check to be sure it’s correct and/or you’re aware of any negative information on your credit history. ● Dispute wrong charges on your credit history. You can do this yourself, and don’t necessarily need a credit repair agency to do so for you. ● Pay off credit card balances as quickly as possible. ● Avoid maxing out credit cards or opening too many new credit accounts in a short period of time. Both practices are red flags to lenders. These are just a few of the top ways to make sure that you achieve and maintain a good credit score. Once you’re there, keep aiming higher, for a strong financial future.